This Solid Red, White, and Black Casual or College Team Sports Girl Dog and Cat Collar comes with a red and black polka dot flower. The collar can be purchased in either a buckled style of slip on martingale style. A matching 5 Ft leash can be purchased in the options when ordering. The flower attaches to the collar by way of wraparound velcro which I have added to the back. The velcro is additionally supported by felt for longing lasting durability and strength of the flower. 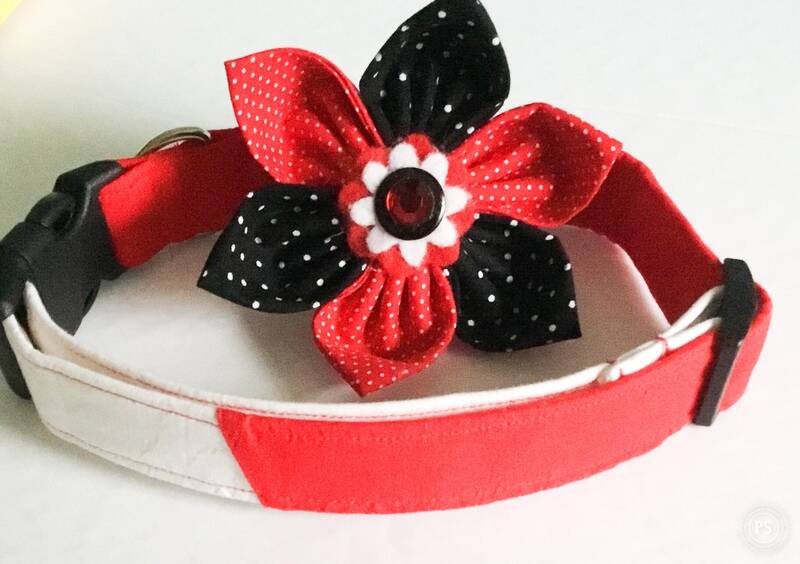 All my collars can be made in all sizes including XXS, XS, S, M, L, XL with option width sizes of 3/8 inches for toy dogs or cats ( Cats receive collar breakaway hardware unless otherwise requested), 5/8 inches, 3/4 inches, 1 inch and 1.5 inches. S- Fits neck sizes 12-15"
Blue & Brown Striped Polka Dot Flower Collar for Female Dogs and Cats- "Michaela"
Purple & Aqua Chevron Flower Collar for Female Dogs and Cats- "Riley"